So, a little background on myself so you don’t think I’m random punter scribbling his thoughts for a fortnight. Like a lot of you reading this, I’m a working rider. I have a full time job as a saddle fitter for Tower Farm Saddlers in Rugby. 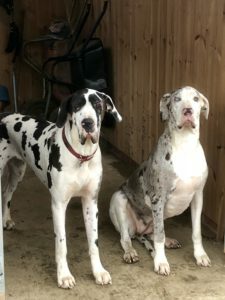 I’m also lucky enough to have two super horses to compete that I ride and care for before and after work, with the help of my partner Fabian, my landlady and close friend Marilyn, and not forgetting, the most important part of the team, Lady Gloria and Lady Dorothy, our two Great Danes. 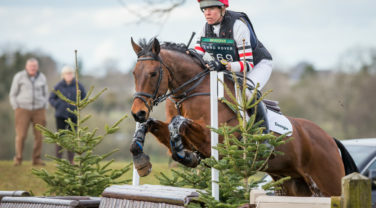 After a long wet, cold, miserable winter of nocturnal riding and horse-care, that I am sure you can all sympathise with, I managed to qualify for the Winter Champs in four classes. My two lovely rides will both do two classes so its all systems go in the Countdown to the “family-outing” down South. Ivanhoe (Apache x Havidoff) is five years old and owned by Davina Wilson. He’s contending the Novice Gold and Novice Gold Freestyle. He’s a beautiful type but the arena will be a big ask for his age. And a bigger ask for me with all those shops. How is a boy supposed to concentrate when valuable spending time is lost on horseback. 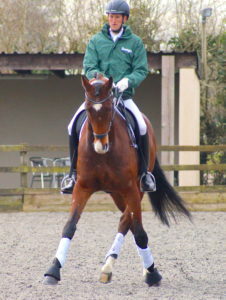 Flores L (Beau x Ferro) is eight years old and on permanent loan to me from a good friend, Shirley Rixon. He’s competing in the Elementary gold Freestyle and the Medium gold Freestyle. He’s a sensitive boy and is affectionately known at home as Flower! He’s a bit like a supermodel. Long legged, elegant and a fussy eater hence my involvement with Dengie, when Danielle Gautrey put on her superwoman cape and came to the rescue. We totally changed his diet, removing all grains and moving him onto a fibre based diet of Dengie Alfa-A Oil and Dengie Performance+ Balancer. Within a week he ate everything and became much calmer in his response to work. For the second time in my life, I’m converted! So with one week to go until the Boys and the Danes hit the M5, on route to gaining the most expensive door plaques in the history of man, I am writing lists of things in a quest to feel organised. Fabian is making the saddle cloths white again. The dogs are causing chaos. The horses are enjoying their time snorkelling in the mud bath, and Marilyn is restoring order to her gin collection. Much like most dressage yards really. I’ll keep you posted on how things are going. Enjoy your week.